What's Wrong With This Birdie? UPDATE, 5:15 p.m. PT: Birdie died. Read what happened to her in the comments of this post. R.I.P. UPDATE, 4:30 p.m. PT: Per instructions from a reader, Nicole, I caught the bird, gave it some water and seed (OK, it was McCormick's Salad Toppers, but I had to improvise not having bird seed on hand!) and then met up with Nicole to take the bird to a guy she knows who will try to rehab him. Will update if we learn more. This poor little guy has been hopping around outside our house for the past day or so. He seems to be weakening -- he didn't even run away when I got up close to shoot this. I don't know what kind of bird he is, whether we ought to take him in and/or take him somewhere or if he's toast. One friend pointed us to this website, but now that I have a picture and everything, I thought I'd throw it out there here. Any thoughts? We knew that the BODIES and Titanic exhibits at the Tropicana were moving to the Luxor, but I don't think I realized what they'd replace. Turns out, the IMAX theater there closes this Sunday and the King Tut tomb and museum goes away on June 22. The new attractions open this fall. This begs a question. The idea behind moving away from the Egypt stuff was that they wanted to make the place hipper, right? The Cathouse, Company, LAX, etc., are all intended to show this Luxor isn't for the kiddies anymore. So they replace two major kid attractions with...two other kid-friendly attractions? Huh? 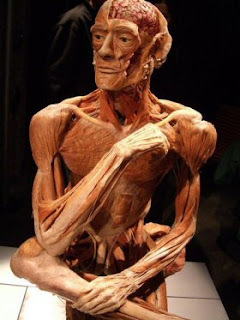 Meanwhile, if you care, I did a piece for USAT a while back on a BODIES-like show in Chicago known as Body Worlds. It's controversial. Read that here. Personally, I think it's cool. 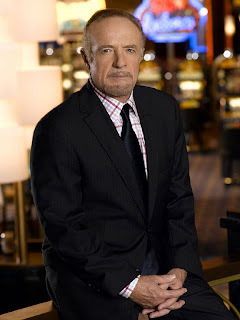 James Caan, honored this year with the Vegas Icon award at CineVegas, was in rare form when I interviewed him last week. With only 500 words available to me for my weekly Los Angeles Times piece, there wasn't room for all of the bombshells. Look forward to more news to break from that chat when it airs on "The Strip" next week. Topics? The now-dead "Las Vegas" TV show for one, Sarah Jessica Parker for another. "I think that people must be taking drugs, because they can't come up with anything new or maybe every story's already been told. That's why I'm looking for writers and waiting for something good to come along." 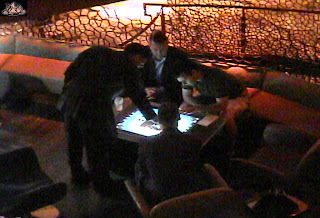 Yesterday, Microsoft rolled out its new Surface technology in the form of six $10,000 bar-lounge tabletops at the I Bar inside the casino at the Rio upon which, via some sophisticated touch-screen tech, customers can play games (video bowling, pinball), view YouTube videos, see who's sitting at other tables and send messages, take photos of themselves to send to friends and, oh yes, order drinks. Above is a photo I took and emailed myself from the tabletop of me playing with it. That's me leaning forward. And here's an 8-minute video I took. 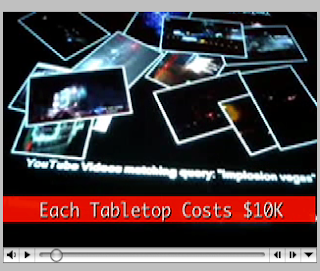 Think of it as The Strip Podcast Goes Pop-Up Video for all the comments I stuck in there. I used the thing to find my childhood home in Syosset, N.Y., which is fun, to virtually bowl and to order wine, among other things. Sometimes it didn't work exactly right. Click below or right-click here to save the video to watch later. Kinda fun, huh? What's more, for the moment it's not reserved for bottle-service customers or anything like that. What's interesting is that this Surface tech is being rolled out here as a way of showing the public what it is in advance of moving it to more domestic and common uses. The quote from Microsoft corporate VP Tom Gibbons that stuck with me during our informal chat was: "We want every surface to be a computer." Which begs the question: Do you? Shark Reef prices going, uh, up??? Just last week, I columnized about revisiting the Shark Reef at Mandalay Bay and puzzled over the fact that the price had risen since my earlier encounters there even though they'd lost their most significant attraction. Well, guess luck, suckers? The price is going up AGAIN. Starting June 21, it'll cost $17 plus tax for non-Nevadan visitors, $14 for locals. This occurs the day after they unveil the newest attraction, the Komodo Dragon. I know these are tough economic times for everyone, but/so I wonder if I'm alone in thinking that this just isn't worth it. Anyone else have thoughts on the Shark Reef?